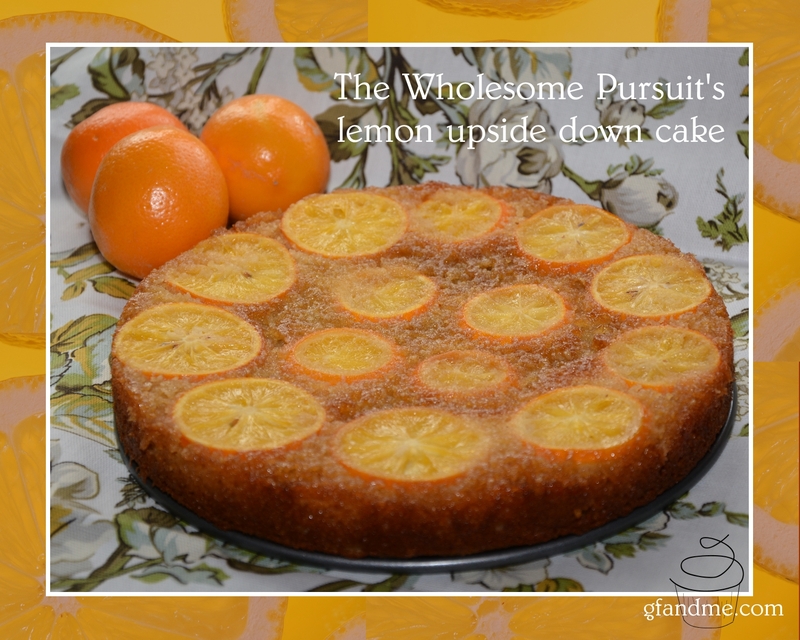 The lemon slices and lemon zest really pump up the flavour quotient in The Wholesome Pursuit’s flourless upside down cake. Made with almond meal, it’s also super moist and spongy and, unlike many gluten free cakes, keeps its flavour and great texture for days. We served it to a party of non-gf friends and they LOVED it, although some found the lemon peel on the sliced fruit a bit too bitter for their taste. Next time we make this, and there WILL be a next time, we’ll be sure to use thinner slices of lemon on the bottom. The cake would also be fantastic with pineapple or orange slices instead of the lemon or even without fruit as a sponge shortcake for strawberries and cream. Hmmmm. I have strawberries. I have cream. I think I’ll go whip one up right now! We added 1 teaspoon of xanthan gum to the almond meal. This helps the cake stick together and after baking gluten free for so long, it just feels odd not to use it. We also added the juice from the lemon we zested. The lemons we used were soooo good, I hated not to use every last little bit! I highly recommend checking out thewholesomepursuit.com. Although not everything there is gluten free, blog author Casey Campbell has some great healthful recipes (check out this dark chocolate avocado mousse – gf and df) paired with some amazing photography. If you enjoy looking at food, this site is eye candy. This entry was posted in Baking, Drinks & Desserts, Recipes and tagged almond flour, celiac, coeliac, dairy free, flourless, GF, gluten free, gluten free in Red Deer, recipe, recipe review, upside down cake, vegetarian. Bookmark the permalink. You’re welcome. I’d never made one either but I’m glad I did!